The Watershed Lab locates MTA’s work as incubator, residency center, and rural presenter upstream of New York City, where its surging energy sustains a creative symbiosis between rural and urban New York. Its primary streams consist of partnerships with a range of presenters, in which MTA serves as the headwaters—the incubator site supporting the creation of new artworks. Just as the Catskills’ mountains, streams, and reservoirs send water downstream to the city, MTA’s rural setting generates original works—and relationships—that travel downstream to NYC and beyond. The origins of Mount Tremper Arts began in 2002 when choreographer Aynsley Vandenbroucke and photographer Mathew Pokoik purchased an abandoned farmhouse in the Catskills. Over the next six years, they slowly rehabilitated the buildings and grounds with tremendous help from a community of artist friends. Hosting art parties and performance events during the pristine summer months, a slow, organic process took place, culminating in 2008 with the launch of a 7-week Summer Festival and artist residencies through the remaining year. Central from day one was the creation of a space by and for artists where community, dialogue, risk-taking, and inquiry could take place outside of the dictates of the market-driven urban art world. The integration of dance and photography between the founders created the groundwork for a multidisciplinary interplay. Aynsley brought to the table a unique sensibility for conversation, community, and engagement, while Mathew brought a strong interest in food, agriculture, love of the mountains, sustainability, and a stubborn determination to conquer bureaucratic systems. Since MTA’s first season, we’ve hosted over 250 residencies for performing arts companies as well as 135 public events, and supported a broad range of emerging to internationally renowned artists working in dance, theater, music, poetry, opera, criticism, and the visual arts. Notable artists have included 600 HIGHWAYMEN, Robert Ashley, Nayland Blake, Anne Carson, Nora Chipaumire, David Lang, Young Jean Lee, Tere O’Connor, Pam Tanowitz, and the International Contemporary Ensemble (ICE). 2017 marked MTA’s 10th year of programming! Check out this short video documentary about the residency program at Mount Tremper Arts! 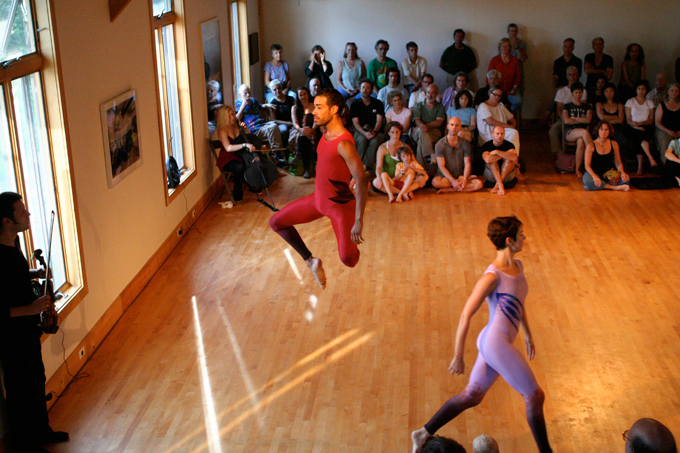 Members of the Merce Cunningham Dance Company, minEvent with ETHEL, 2010 Mount Tremper ArtsSummer Festival.